You might recognize a few of these! Though the novels I loved were set in the Wild, Wild West, he also wrote about the Orient and the Middle East. He presented his writings as travel literature based on his experiences. He was, in fact, an armchair fantasist—his “experience” at that time was based on books he had read and a highly imaginative mind. 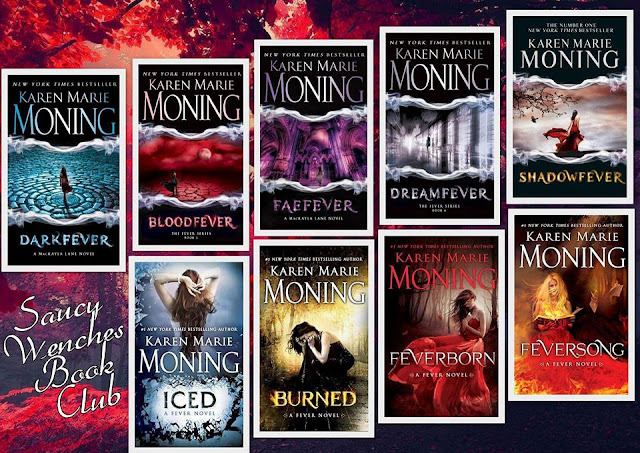 I admire authors who can transport me so completely outside the boundaries of my own little world that I become immersed in their fantasy realms. His western tales became every bit as real as my own world to me. After the jump, I’ll tell you a little about this amazing author and the stories he created. Karl Friedrich May (25 February 1842 – 30 March 1912) had a colorful life. 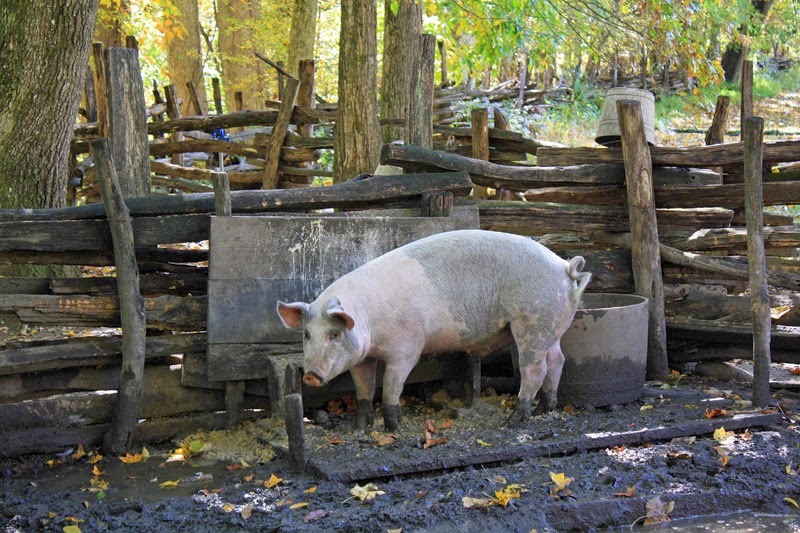 His family was very poor, there was poverty and even hunger at his home. Apart from school studies, his father had some rough educational methods at home. After school, he was forced to spend hours copying text from the encyclopedias, prayer books, and stories about nature that his father had gathered for him. If he failed to complete his allotted work in time, he would get a whipping with a birch switch. 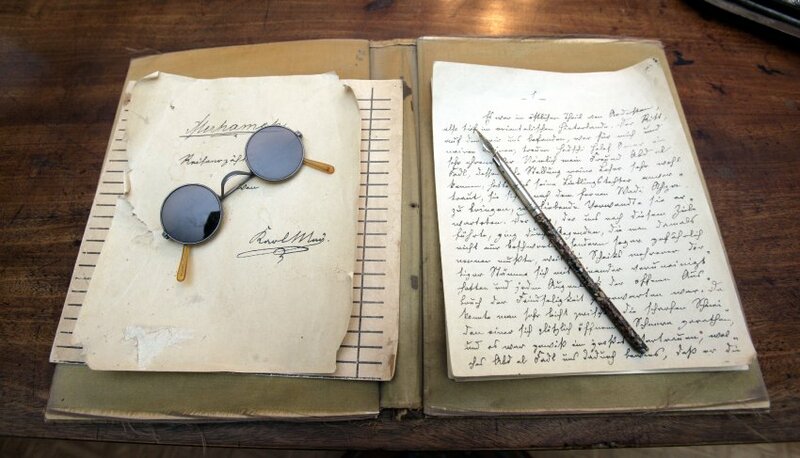 He began writing after his release from prison in May 1874, returning to his parents’ home. He managed to make a modest living writing pulp fiction. 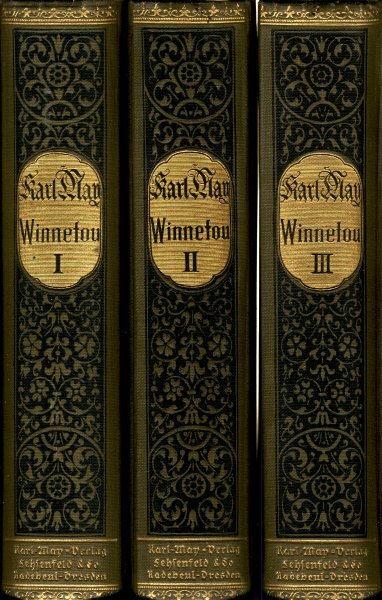 In 1892, May began writing two series, called Travel Novels. He added to them through the 1890s and beyond; by the time of his death, the collection had 32 volumes. Writing and publishing the Winnetou and Old Shatterhand novels became his biggest break. May suffered through considerable hardships in his later years. His criminal record came back to haunt him when he went to court in an attempt to keep his own publishing rights and prevent the unauthorized alteration of his novels. But he persevered. Just a few days before his death in 1912, he gave a lecture in Vienna about his life and work before an enthusiastic audience of 2000 fans. Many decades later, I was captivated by Karl May’s Winnetou stories, galloping towards the sunset with Winnetou himself. His books were my initiation to a new world―of Indians and Cowboys, great warriors and noble gunmen...thousands of miles away from where the author or I lived. 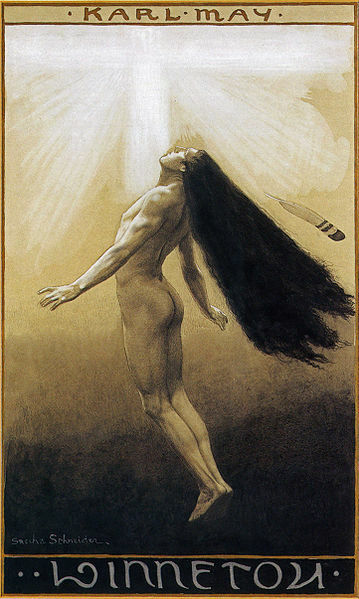 Karl May created idealistic archetypal characters, struggling for loyalty, dignity, friendship, love, and peace. There was the Native American Chief Winnetou, or “The Red Gentleman”, as he was called, The idea of a “Noble Savage” was popular at the time. 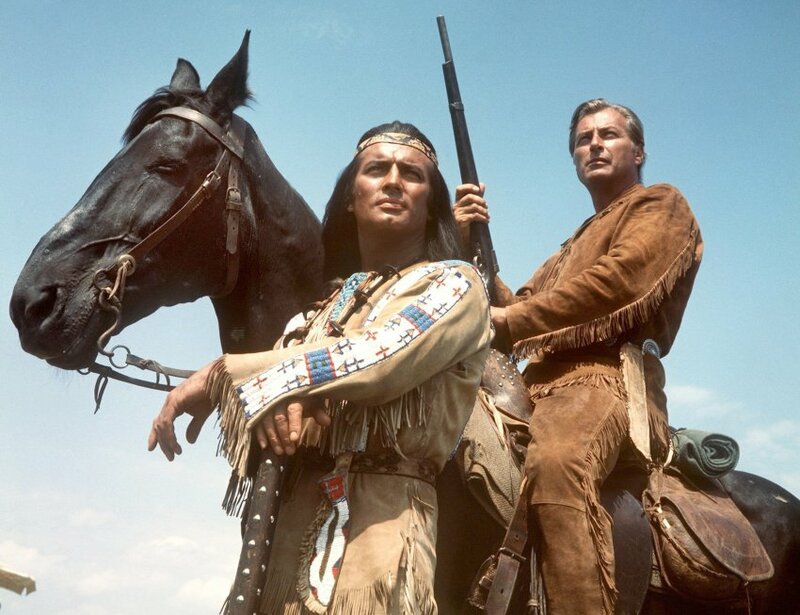 There was Winnetou’s German brother Old Shatterhand, who was really May’s alter ego. Here are descriptions of his most famous characters from the Karl May USA website. Although the series is called Winnetou, after the young Apache chief, the immigrant Shatterhand is actually the main character in all books. When he first arrives in American, because his general knowledge about the Wild West was very limited, he is referred to as "Greenhorn," but he is strong and brave and shows his courage when fighting a grizzly bear with a knife in hand. Because Shatterhand is fresh from abroad and the possessor of ancient Teutonic values, he is honest and moral without being a scold, and he is untainted by the ways of the white man out in the West. He is like Superman and the Lone Ranger, all rolled into one, and he is the ultimate immigrant success story. He represents a way of thinking, a mind set. The philosophy that underpins Karl May and Old Shatterhand is the chivalric code of the mounted knight, a bedrock foundation for the European market. He is as young as Shatterhand as savvy as Sam Hawkens, and as beautiful as the animals of the prairie. He is the noble savage, morally strong, completely incorruptible. He is also something of a politician in trying to keep the Native Americans from fighting with each other, while he molds them to oppose the encroachment of the White Man. He trusts Shatterhand. Like Sam, he has much to learn from Shatterhand. He is older, but colorful, and knows more about the West and how to live in it than just about anybody alive. Because he dresses in old leather skins, he looks like a hobo who may be easy-pickings, but don’t mess with him, or he’ll be behind you with his old gun “Liddy” before you can blink. You might think of him as a Gabby Hayes-type. Sam undertakes teaching Shatterhand about life in the West. And though he often doesn’t want to hear it, his friend Shatterhand, with his strength and purity, has much to teach Sam in return. But would it? Would Winnetou succeed in finding Santer and avenging the murders of his father Intshu–tshuna and his beautiful sister Nsho–tshi? Would the two blood brothers ever meet again in that vast, raw land? I found this movie program listed on eBay. 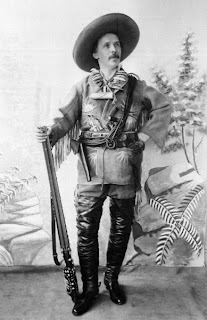 Karl May identified fully with the character who represented his alter ego, Old Shatterhand. He even named his house “Villa Shatterhand”. He posed for photos as Old Shatterhand, like the one here, and requested that a rifle maker in Dresden create copies for him of the most famous weapons from his books, to hang on his house walls. He was on top of the world. German literary critics dismiss his work as second-rate. 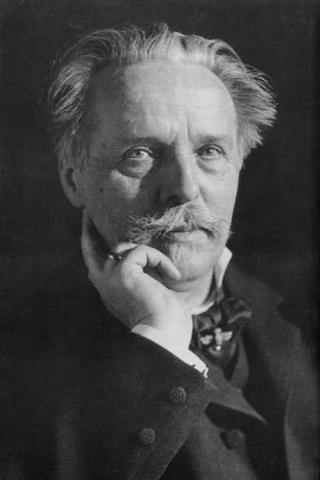 Yet, Karl May has become the best-selling German author of all time! The Karl May press in Bamberg claims over 100 million copies sold worldwide, and almost all German children and adults read Karl May’s books. 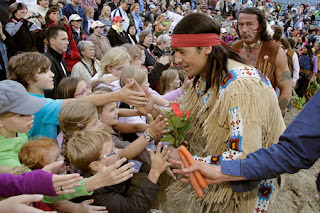 There are popular Karl May festivals across Germany every summer, where people dress up like cowboys and Indians and hang out in teepees with various “cowboy clubs”. had a hugely successful season. Some researchers claim that May was mentally ill and suffered from a narcissistic personality disorder. Once, when he was invited to an audience at the court in Vienna, he had his assistant inquire whether he was to appear as a “cowboy” or an author. The archduchess chose the latter. Someone once knocked on his door and asked for a strand of Winnetou’s hair. The visitor was overjoyed when the author sent him on his way with a handful of black horsehair. But I don’t care at all. For me, his works remain adventure literature, driven by the author’s desire to dream his way “out of the box”, introducing places and images his readers had only heard about. A few years before his death on March 30, 1912, he finally made the trip to America. May visited New York, Boston, and Niagara Falls. The highlight of his journey was a visit to the reservation that was home for 400 descendants of the once-powerful Tuscarora people, one of the nations of the Iroquois tribes. Between 1912 and 1968, German cinema screened 23 movies based loosely upon novels by Karl May. American actor Lex Barker (aka Tarzan) is best known in Germany for his role as “Old Shatterhand” in several Italian-German “spaghetti westerns” of the 1960s. 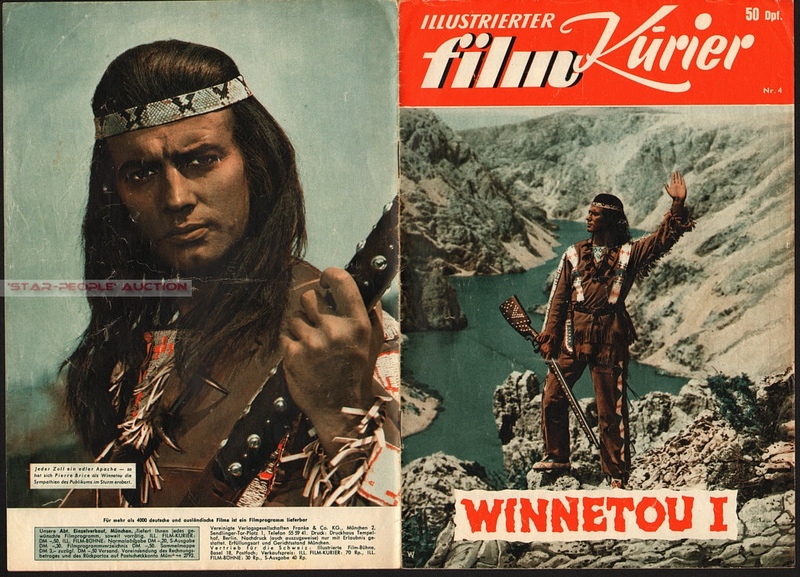 The role of the Indian Winnetou was played by a Frenchman, actor Pierre Brice. From the German "Winnetou" Euro Westerns, based on books written by German author Karl May. Winnetou is played by Pierre Brice and Old Shatterhand is played by Lex Barker. 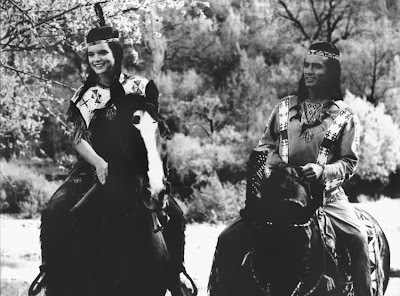 Actor Pierre Brice as Winnetou, on right,actress on the left is Uschi Glas. May’s Winnetou book was translated to English in 1999 by David Koblick; his Oil Prince book was translated in 2003 by Herbert Windolf. From Nov. 18, 2012, to Feb. 9, 2014, the New Mexico History Museum is celebrating his life, legacy, and lasting impact in Tall Tales of the Wild West: The Stories of Karl May. Oh, he also has an asteroid named in his honor: Asteroid 15728 Karlmay. Well, dear readers, my tiny journey into the past is at an end now. I hope you enjoyed it. 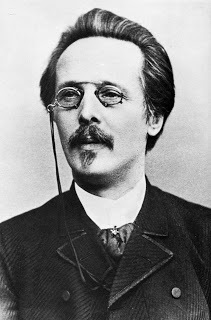 I am curious whether any of you have ever heard about Karl May. Copy of his manuscript located at the Karl-May-Museum Radebeul. 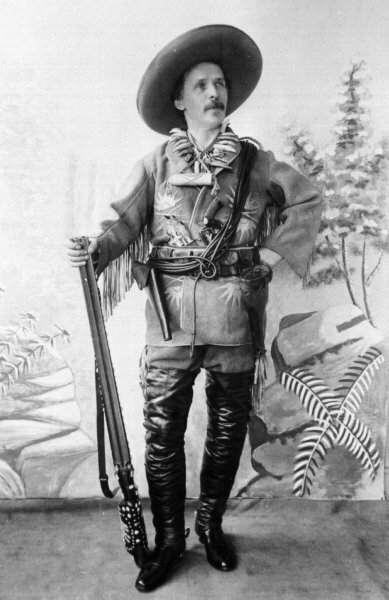 Karl May was called, in some places, the German Louis L'amour. I've heard about him but not about Zane Grey, I'll look him up. Merit, I loved your post. I had never heard or Karl May. Thank you for the introduction to his work. Hungarian here, also grew up on Karl May (and Cooper, and the Great Bear books). Winnetou was my hero. 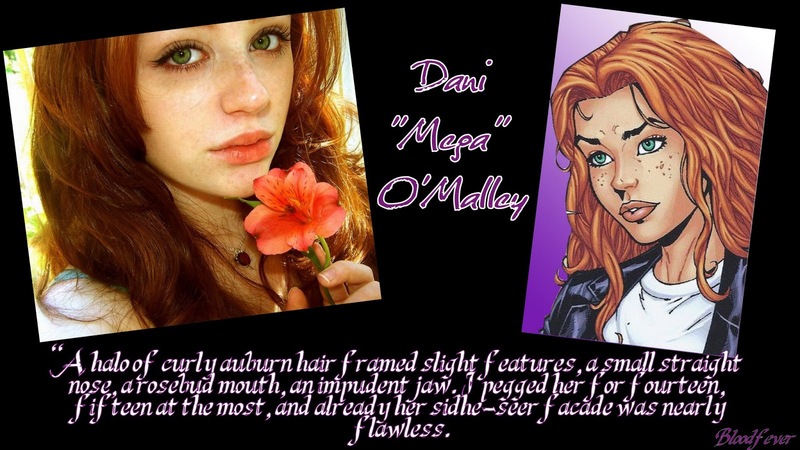 Old S is a LITTLE bit too perfect (being an Author Avatar Mary Sue).